Your dog is another member of your family, so why not provide them with a warm bed that they can call their own? Heated dog beds are a great luxury that can keep your pooch warm on those cold winter nights. Regardless of your dog's size or fur length, they can feel the effects of the winter season just like you. A heated bed can help them relax, keep them safe, and alleviate any pain they may be feeling. These unique beds utilize a heating element hidden deep within the padding and fabric. To the undiscerning eye, they look like any other bed. Only your pooch will know that they're being spoiled and cared for. Beds come in a variety of shapes and sizes to suit any pup. Here's a collection of high-quality beds to spoil your furry friend. Keep your furry friend warm around the clock with this bed from K&H Pet Products. It utilizes a removable heater that can run all day long. There's no setting to remember or complicated controls to fiddle with. The heater is designed to raise the temperature of the bed 10 to 15 degrees higher than the ambient air temperature. It's available in two different sizes and utilizes a plush bolster design. The side bolsters raise up 5 inches to create the ultimate headrest. A soft pillow in the middle houses the heater. The entire pillow can be removed for easy cleaning. Make your dog's crate or dog house comfortable with this heated dog pad. The pad is available in medium, large, and extra large sizes. The extra large size measures roughly 33 inches wide by 43 inches long. Two layers of orthopedic foam are used to keep your pup comfortable. It's designed to never sag or lose its shape. The foam is covered by a fleece on the top and a slip-resistant material on the bottom. The heater is built into the foam. It uses a dual thermostatic control to raise your dog's temperature. Both the fleece cover and the heater are removable. If you're looking for a bed that can be used indoors or out, consider this heated pad. The cover is made from a soft PVC material. It's waterproof and holds up well to outdoor use. Inside the cover is orthopedic foam. It molds to the shape of your dog's body to support their joints and muscles. You'll never have to worry about the bed losing its shape. The heater inside is thermostatically controlled. It's programmed to never go above your pup's current body temperature. This helps to improve safety and give control to your dog. 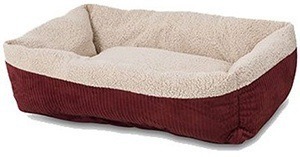 This luxurious bed is available three sizes to suit any pet. The largest bed measures roughly 35 inches wide by 45 inches long while the smallest is 20 inches wide by 23 inches long. It's made from durable nylon. Because of this, it can be used inside or outside under cover. It features a wide bolster around the entire perimeter of the bed. The heater is controlled by an automatic preset thermostat. It heats up to your dog's standard temperature and maintains it. The heater and the cover are removable for washing. To keep your pooch safe, the cord is also wrapped in steel. Keep your dog warm when the temperature drops with this bed from PetSafe. The low-voltage heater provides warmth without being overbearing. It applies enough heat to soothe the joints and raise your dog's body temperature. The heater is attached to a chew-resistant cord for safety. It's easy to operate and doesn't have any complicated controls. Simply plug it in and let your dog enjoy. 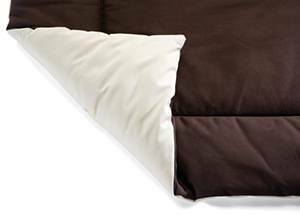 While the heater itself can't be removed, the bed comes with a two-sided cover that can be washed in a machine. The flat bed features light padding and a quilted pattern for strength and durability. 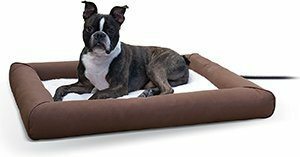 Let your dog get cozy without having to worry about accidents or injury with this self-warming bed from Aspen Pet. It doesn't contain any heating element or electronic components at all. It relies solely on your dog's own body heat to warm up. The bed cradles your dog, gathers heat, and stays warm. It's made from faux wool and corduroy. The bottom is slip-resistant to keep your pet stable as he sleeps. The bed comes in a variety of sizes and two colors. It also has a built-in bolster for added comfort. A heating bed is only effective if your dog is willing to use it. There are a number of things to consider when you're looking for that perfect bed. You should match the bed to your dog, home, and lifestyle. The size of the bed should be the first thing you consider in your search. The bed will be useless if your dog can't fit into it. If your pooch already has a bed, measure its dimensions to find a suitable replacement. If not, measure the length of their body. While most dogs like to curl up when it's cold out, they also like to spread out every once in a while. Make sure that they have plenty of room to lounge. In addition to measuring your dog, make sure that you have room for the bed. Find a spot in your home and get a bed that adequately fits. You may also consider putting the bed in a crate or on top of a couch. Whatever the case may be, just make sure to take measurements. As with anything that comes into contact with a rambunctious dog, there's always a chance of destruction. It's more important than ever to go with high-quality materials. Options made from polyester and fleece usually hold up well to regular wear. Avoid softer fabrics like cotton. With a heated bed, you need to keep an eye out on destructive behavior. These beds have electrical wires and heating elements built right in. They're fully capable of harming your dog, so keep a close eye on it. Another thing to consider is how easy an item is to clean. Does the heating element come out? Is it machine washable? Will the fabric deteriorate in a couple of washes? A well-built bed should be easy to clean. It's going to covered in stray hairs, so make sure that you have the option to give it a good refresh every once in a while. Some heated dog beds have precise controls that let you manipulate settings the way you want. Others don't have any controls at all and simply start heating up once it's plugged in. It's good to consider your dog's preference. If they're sensitive to excessive heat, that extra precision may come in handy. Also, pay attention to where the controls are placed. You may need to hide the controls or place them out of reach. Always think about how your dog will react to the device to ensure safety. There are a few different types of heated beds to choose from. While they're all effective in doing their job, you may lean towards a particular type of bed based on your dog's behavior and lifestyle. Bolsters are a common design that's utilized in standard dog beds. They feature a flat padded bottom and raised sides. Dogs can spread out and lay their head on the sides or curl up into a ball. The basic design principles of this type of bed provide versatility and comfort to your pooch. Heated bolster beds have heating elements located inside the bottom pad. If your dog sleeps in a crate or dog house, pads are the way to go. Heated dog pads feature a thin flat layer of foam or cushion. The heating elements are typically found in the center of the pad. Pads don't take up a ton of room and usually come in a range of standard sizes to fit crates. Weather-resistant dog beds are made for outdoor pups. They often have rigid bottoms made from a thick plastic like PVC. The PVC material holds a liner made from a softer material. The PVC helps to keep the soft portions of the bed off the wet ground. It's easy to clean and the liner can be removed for washing. Outdoor heated beds are built to withstand the elements. They typically have longer cords and are sealed tighter for security. While they are made to be outside, they should still be kept under cover and out of the rain. Self-warming options are great for dogs that are prone to chewing on their bed or for owners that want to keep their energy costs low. These beds look the same as other heated beds in appearance. However, they don't contain any heating elements. The heat is generated by your dog. They're filled with thick insulation that decreases heat dissipation. As your dog lays on it, their heat will transfer to the insulation. 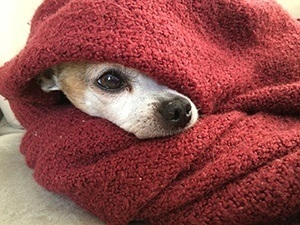 The temperature will rise over time to keep your pup warm. While they may be viewed as an unnecessary accessory by some, heated dog beds are very practical. They can help dogs in a number of ways. They carry a number of benefits for dogs of all ages, sizes, and breeds. One of the biggest benefits is that they simply bring comfort. If you live in a colder environment or have a dog that sleeps outside, a warm sleeping spot is a must-have. Dogs can relax and get to sleep faster if they're comfortable. A heated bed can also directly affect dogs that have a difficult time regulating their own body temperature. Senior dogs and younger puppies that have just weaned off their mothers have to work much harder to stay warm. A heated dog bed does that work for them. It can also help ease your new puppy into adulthood. Younger puppies tend to have a hard time being by themselves because they're used to being coddled by their mothers. That added warmth replicated that feeling. If your dog suffers from any bodily pains, they may be able to get relief from a heated dog bed. Heat is great for soothing the joints and getting rid of muscle pains. Dogs with arthritis, hip dysplasia, or a variety of other ailments can get relief and sleep comfortably throughout the night. Are Heated Dog Beds Safe? Generally, heated dog beds are safe. 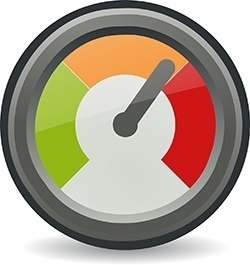 Manufacturers have taken many precautions to ensure that their products will bring comfort instead of harm. With that being said, they do come with some inherent dangers. 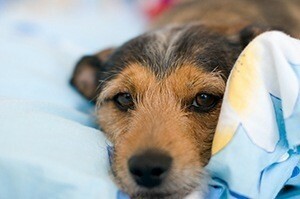 To remain safe, you have to monitor your dog's behavior and the overall condition of the bed. You need to take the proper precautions and be wary of a few different issues. Cords should be tucked away if possible and always covered with a protector. Many beds come with a chew-proof cover built right in. However, they can be purchased separately. They're often made from metal and coil around the length of the wire to keep your pup safe. Dog beds sink over time. Your pooch's weight will cause the middle of the bed to sag. While this usually isn't a problem, it can become a hazard with electrical dog beds. If the bed sags too much, your dog may make contact with the heating element. This can lead to significant burns. You should always go for thicker beds and keep a close eye on its sagginess. Once it's reached a certain point, you'll need to get a new bed. Your dog deserves to be spoiled with a heated dog bed. These beds are a great investment that can make your furry friend feel comfortable regardless of the weather outside. With the numerous options available, you'll have no problem finding an option your pup loves.